The story of Hannibal and the Carthaginians during the second Punic war (218 b.c. - 202 b.c.) against the Romans is a great example of how logistics has been leveraged to gain a competitive edge when fighting a war. Not surprisingly, Hannibal was considered by the Romans the greatest enemy they had ever faced. At that time, Carthage, located on the Northern coast of Africa (near today's city of Tunis) and Rome were on a temporary peace after the first punic war - won by the Romans - but always looking to take over each other's supremacy over the Mediterranean Sea. Both economies were very much dependent on the commercial trade lanes within the Mediterranean sea - probably Cathage more than Rome - in order to continue their prosperous commerce and to sustain their economies based on the exchange of key raw materials mainly coming from the Eastern countries (Greece, Lebanon…). But if not on the sea, the only option to win the Romans would be to invade them by the mountains, going through the Alps, taking them by total surprise. A major challenge that would have required the greatest logistics organization to make it happens and that could only be designed by a Logistics Genius, Hannibal. Indeed, the keys for the victory should have been the surprise effect and the speed of the execution: when very few would have expected the Carthaginians to attack, practically nobody would have thought that they would not come by sea but they would walk out from the Alps. Carthage was one of the most successful marketplaces of that time. It was till the Romans understood the value of controlling this sea trade and started to expand their influence every day more. This was one of the key drivers of the first punic war and now the situation was a sort of "cold war" between the two great enemies, Rome and Carthage. How to keep their flourishing commerce while breaking the growing power of their "dangerous" neighbours became the key question for the Carthaginians. At first glance, the war against Rome didn't seem the best option as Carthage had already tried (during the first first Punic war) to fight them without success. One of the lesson painfully learned from that war was that the Carthaginian fleet seemed to be much weaker than the Roman one, hence, a sea battle would have meant a sure defeat. This is when the character of Hannibal, a young general, son of Hamilcar (one of the most famous Carthaginians generals) came into the scene. This ambicious young man had been living in Southern Spain in the Carthaginians colony ruled by his father Hamilcar. At his death, he took over the power and start planning his Great Plan: how to beat the Romans in their own country, Italy. After years of careful preparation, everything was ready he only needed a pretext that was caused by the Romans (to defend the rights of the old city of Saguntus). Really, it was the confrontation of two great countries and two great armies, "No states, no nations ever met in arms greater in strength or richer in resources; these Powers themselves had never before been in so high a state of efficiency or better prepared to stand the strain of a long war…." This excerpt from Livy's history of Rome clearly summarises the situation before the war. The only possibility to make this strategy work, was to prepare an extremely detailed analysis of the logistics to support a march of an army of more than 40,000 people (some say 60,000) through half of Spain - Hannibal headquarter was located in New Carthage, in the South of Spain - till the North of Catalonia, crossing the Pyrenean mountains, marching through Southern Gaul (i.e. France) and, eventually, after having crossed the Alps, arriving in Northern Italy. You may easily imagine the challenge to face in order to be sure that nothing could go wrong: from supply of the water to the type of indumenta the soldiers should have carried considering they had to cross snowy mountains and hot valleys. For more than 6 months the best Carthaginian logisticians were together to prepare one of the greatest military journey of history. Probably, only the Indian campaign of Alexander the Great was similar in terms of logistics difficulties also considering the poor knowledge available at that time about the different countries and geographies. 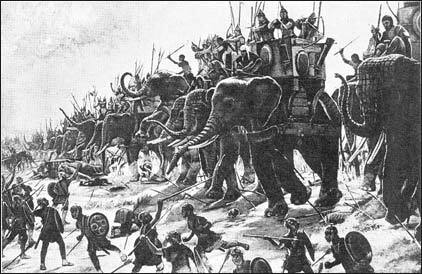 In spring of 218 B.C., Hannibal brought his plan into execution, starting a march of nearly 1600 kilometers with an army consisting of highly trained Carthaginians mixed with strong and reliable Spaniard infantry and the Numidian cavalry (also famous for his courage), as well as 37 elephants. So, not only, he went for the most difficult path to reach Italy but he also decided to take with him the elephants counting on them as a significant competitive advantage when engaging a battle against the Roman army. But on the other side, he was very conscious that making such a march with the elephants would have significantly slowed down the whole journey. "So, why also the elephants" (that became so famous but, at the end irrelevant, for the result of the whole war campaign)? Well, it is nearly sure that Hannibal's military strategy was probably derived from the lesson of his father, Hamilcar, who always believed in the use of elephants as a "fear creation" machine. 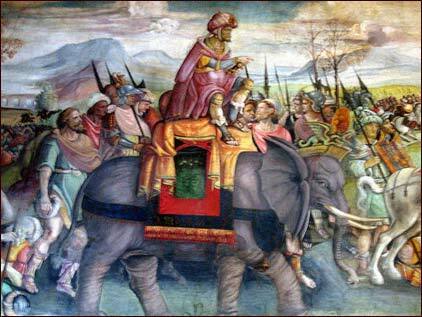 Also, it is worth to mention that the Carthaginians have not been the first to use elephants in battles. When Alexander the Great, marched to India, he had to fight them in the battle of the Hydaspes river (326 b.c.) against the empire of king Porus. Nevertheless, crossing the Alps with such an army and with these animals was a very challenging goal. While his plan was nearly perfect and he designed to go through the mountains at the end of the summer, he didn't expect the counterreaction of some local population. Clearly, they couldn't stop the Carthaginians army who were better trained and bigger in size, nevertheless, they slowed them down so that when the whole army reached the mountains, it started snowing, making the crossing of the Alps really dangerous. Eventually after 15 days of pain and struggle, Hannibal was able to arrive into the plain of Po, near Turin. But the balance of the journey was in "red". Only part of his army, 20,000 infantry versus the initial 60,000, was able to make it and the losses included also part of the cavalry. Futhermore a lot of his precious elephants suffered so much through the descents that they died immediately after, nearly all but one. However, the Carthaginians army were reinforced by some local Gauls populations being recruited thanks to their hate against the Romans. Hannibal was perfectly conscious, from the beginning, of the type of sacrifices his plan would have implied in terms of human lives and animal losses. But he also knew that the overall strategy would have created a major astonishment among the Roman generals. And, indeed, the overall plan was successful, it didn't create astonishment, it created chaos. When Hannibal arrived near the Po River with the surviving army, he was able to defeat the Romans twice: in a cavalry fight near the river Ticinus (east of Turin) and after at the river Trebia (west of actual Piacenza). He then continued further south in direction of Rome, while the chaos in Roman army became panic………….. and in March 217 b.c. (nearly one year after his march through the Alps), after having crossed the mountains called Apennines, he defeated two entire Roman legions in a major battle near the lake of Trasimeno. At that point, Hannibal was really on the edge of defeating the Romans and every historian or military leader would agree that his series of victories were due to his audacious strategy and his leveraging of LOGISTICS as a KEY WINNING TACTIC. The surprise effect of invading Italy from the Alps was so strong that the Romans couldn't oppose any valid resistance to Hannibal progress towards the "Urbe". Did he eventually win the war? No, he did not. The second punic war ended with the victory of the Romans. Hannibal, the logistics military genius, made two major mistakes. First of all, he thought that the Roman league would fall apart once he had invaded Italy. It wasn't the case at all; nearly all Roman allies remained loyal and continued to fight against the invaders. The second mistake was even worse. After having arrived at few miles from Rome, he didn't take the city but prefeedr to go further South to wait to get better re-organized. However, while wasting his time in negotiating with his government to get additional fresh troops, he under-evaluated the Roman organization capability and capacity. In fact, who benefited from the pause were indeed the Romans who, after 16 long years of fight with the enemy, ended up beating them in Zama. YourGuidetoItaly.com 2005-2012 © All Rights Reserved.